Psst…! I don’t wish to alarm you, but Valentine’s Day is right around the corner! Now, before you panic and grab your phone to try and make a dinner reservation, allow me give you a better option: a totally fussy, outright gourmet restaurant-worthy dinner lovingly prepared in your own kitchen! I don’t know about you, but I think that a home-cooked dinner beats going out to an overpriced, crowded restaurant any day! First and foremost, I will warn you that this recipe will take some extra time and a few steps. You will dirty not one, but a few pots and pans. After you’re done, your kitchen will likely look like a tornado hit it, and for this, I apologize. But, this is a special meal, and I promise you, it will be so delicious, your sweetie will happily volunteer to do the dishes for you! Plus, no long wait times, overwhelmed servers and outrageously priced prix fixe menus! I think it’s a win-win! 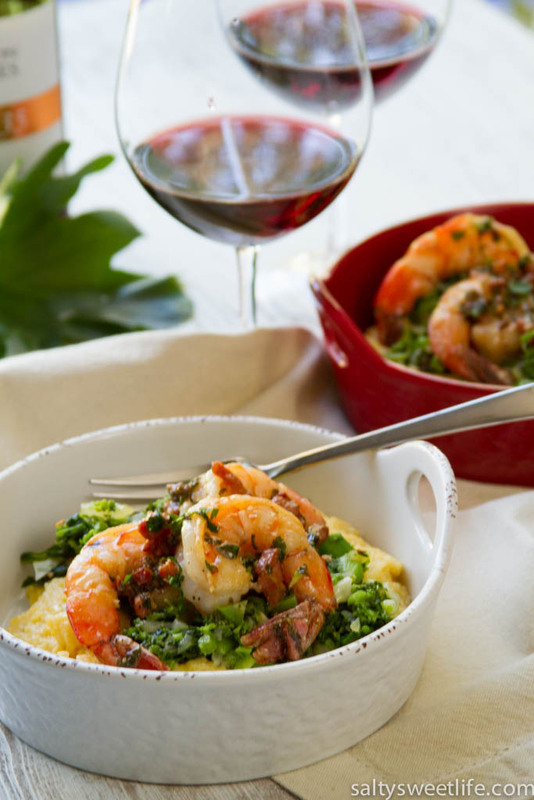 This recipe is a take on a traditional Southern classic – shrimp and grits, but with a bit of an Italian twist! 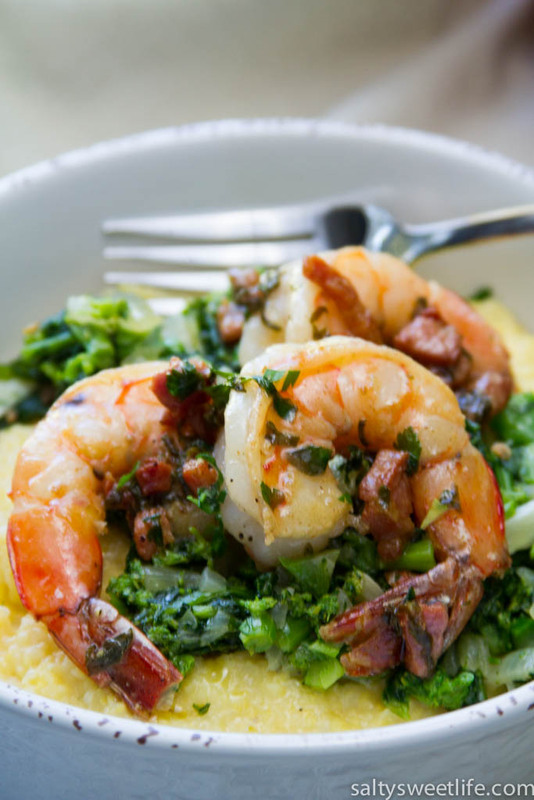 Sweet, succulent shrimp are cooked with smoky pancetta, perched atop a bed of pungent broccoli rabe and nestled on a foundation of creamy, cheesy polenta! Broccoli rabe, also called rapini, can be difficult to find sometimes, so when it’s in season (like right now), I grab it! It looks similar to broccolini, but has more of a bitter bite, very similar to its cousin, turnip greens. I happened to find some at Whole Foods Market, but if it’s not available in your area, Swiss chard would make a wonderful substitute in this dish. There are three components to this dish and they are all cooked separately and assembled at the end. 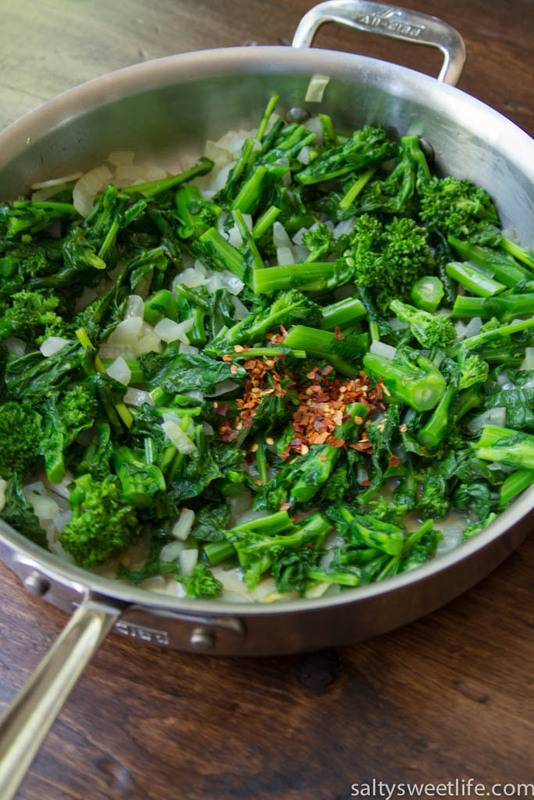 The broccoli rabe is blanched first to remove some of it’s characteristic bitterness, then sautéed with onions, garlic and red chili flakes. The polenta cooks slowly and gently in chicken stock flavored with thyme and rosemary and finished off with sharp cheddar and Parmigiano-Reggiano cheeses. 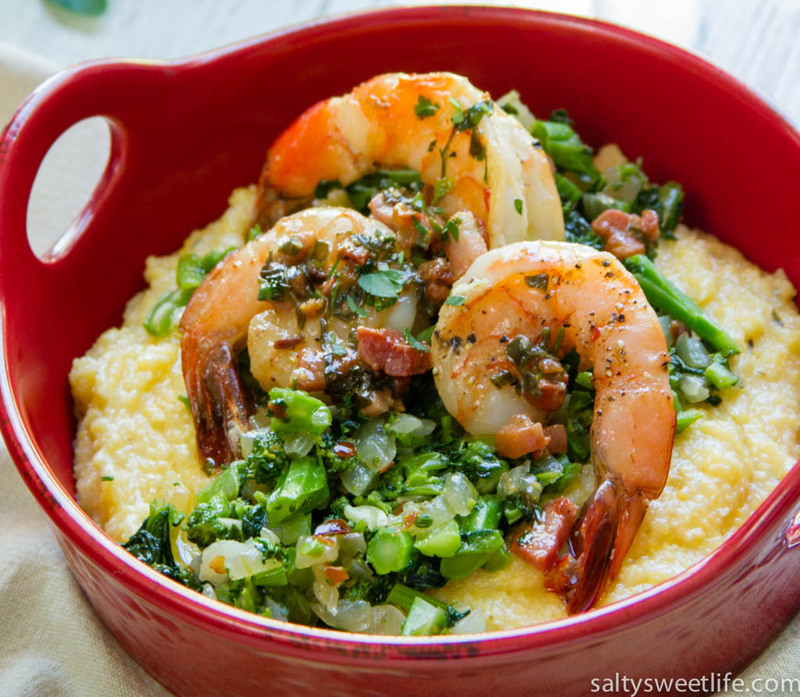 The shrimp cooks very quickly in olive oil and pancetta and is finished with a lemon-butter sauce. So, if you’re with me, lets get started! For the sake of timing, boil the water for the broccoli rabe first, then start on the polenta. The shrimp is the very last step. Difficulty: fussy but not difficult! In a non-stick saucepan, bring the chicken stock and herbs and salt to a boil. Slowly whisk in the polenta and allow it to return to a boil while continuing to whisk. Reduce the heat to low and continue to cook, stirring occasionally, for approximately 30 minutes. Add the butter and cheeses to the polenta and whisk to combine. Remove from the heat, cover and set aside. Wash the broccoli rabe thoroughly in a sink of cold water and pick off any yellow or wilted leaves. Cut off the bottom third of each bunch and discard. Bring a pot of well-salted (add 1 1/2 tablespoons of salt) water to a boil. Fill another bowl with ice cubes and water and set aside. 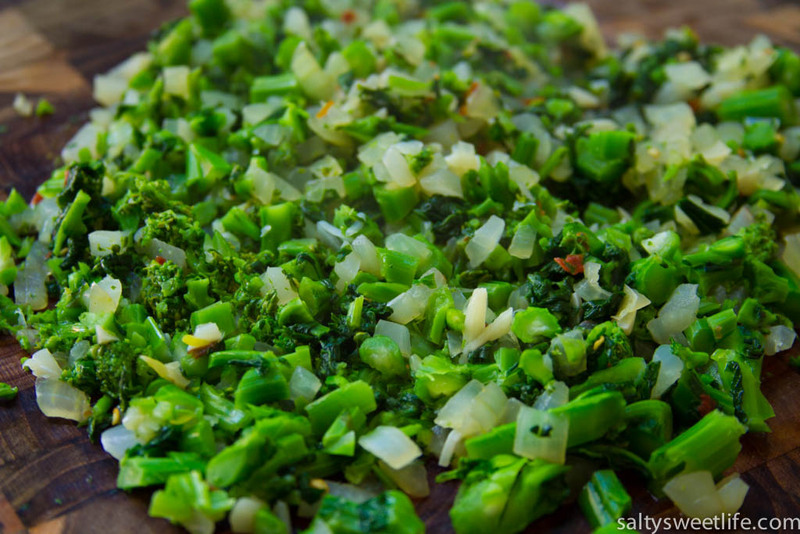 Add the rapini to the boiling water and cook for one minute–set a timer! When the minute is over, remove the rapini with tongs and immediately plunge into the ice water. This stops the cooking process. After the rapini cools, drain it in a colander and roughly chop each bunch into 3 or 4 pieces. Pour one tablespoon of olive oil into a frying pan over medium heat. Add the onions and garlic and sauté until the onions become translucent, about 5 minutes. Add the broccoli rabe, the chili flakes, salt and the chicken stock and sauté for 15 minutes or until there is no chicken stock left in the pan. Dump the vegetables onto a cutting board and with a large knife, finely chop the vegetables. Place the vegetables back into the pan and set them in a warm spot–inside an oven heated to 170 degrees is perfect. *If you are not using broccoli rabe and are substituting Swiss chard, you do not need to blanch it. Chop the stems separately and add them to the pan with the onions and garlic. Then add the leaves (roughly chopped) and sauté for 15 minutes. Proceed with the remainder of the directions for the vegetables. In a cold sauté pan, add a drizzle of olive oil and the pancetta, then over medium heat, cook the pancetta until the fat renders. Remove the pancetta and set it aside, leaving the fat in the pan. Lightly season the shrimp with salt and pepper and add them to the hot pan. Cook the shrimp for about one minute on each side, until the shrimp turns pink. 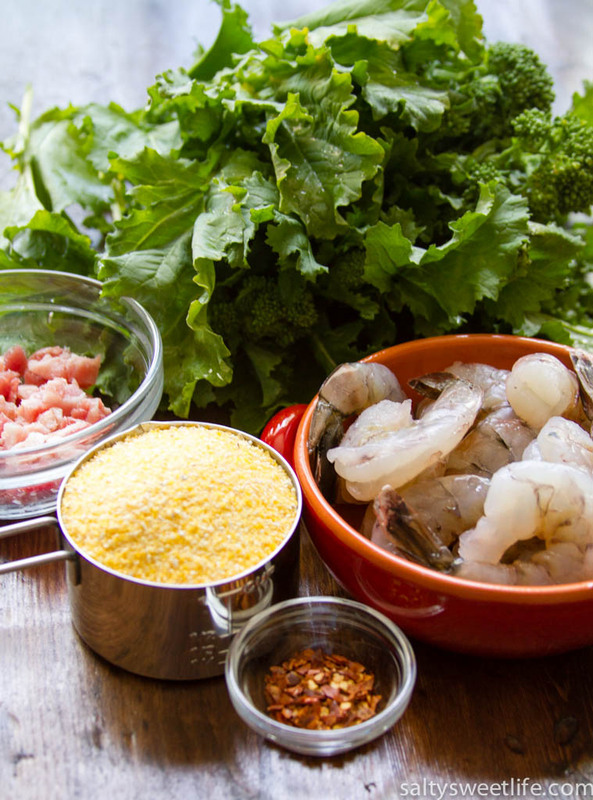 Remove the shrimp, setting it aside with the cooked pancetta. Add the butter to the pan and after it melts, add the parsley, green onion and lemon juice. Stir quickly to combine, then return the reserved shrimp and pancetta to the pan. Toss the shrimp to evenly coat it with the pan sauce. To serve, spoon the polenta into a bowl or plate. 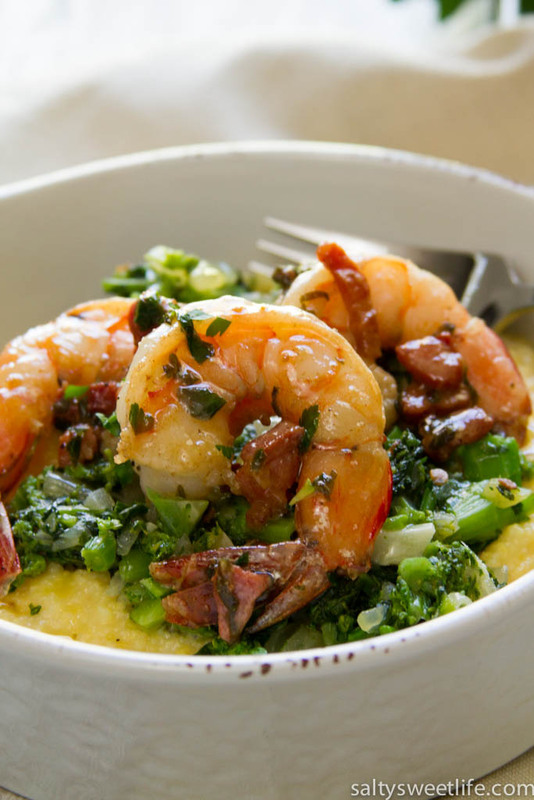 Top the polenta with a generous spoonful of the broccoli rabe mixture, then arrange the shrimp on the broccoli rabe. Spoon the sauce over the top and serve to rave reviews! Tracey you are killing me right now!!! I need some of this pronto and what a perfect valentines day dinner! Thank you so much Christina! It was so good! Well worth the mess! Happy Valentine’s Day to you! G’day! Love your photos and recipe! LOVE grits! YUM! Hello Joanne! Thank you so much for checking out the recipe! I am a grits girl through and through! Just tried this recipe and it is amazingly delicious and very filling. I’m so glad you enjoyed it!! Thanks for letting me know!